The stage is being set in Greenville, S.C. for the 40th Annual Joint Meeting of the Southeast U.S.-Japan Association (SEUS) and the Japan-U.S. Southeast Association (JUSSA Japan) October 21-24, 2017. 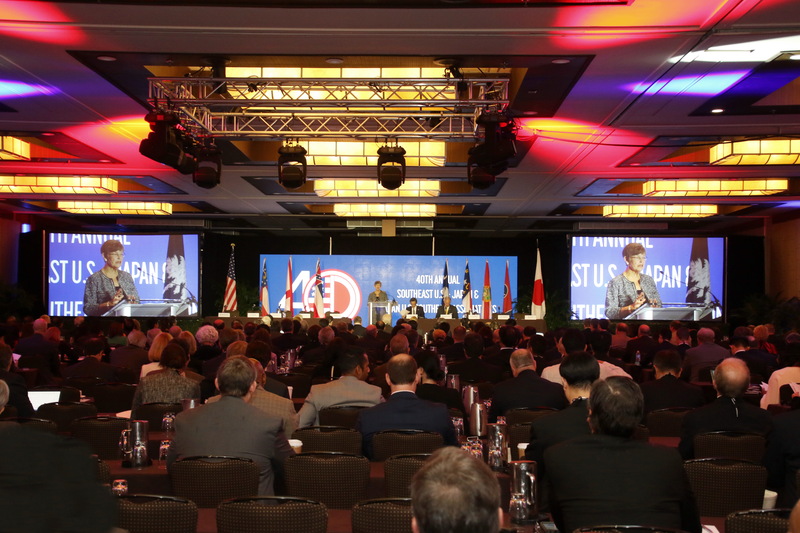 This prestigious gathering of global business leaders celebrates longstanding economic and cultural ties and offers delegates from Japan and seven southeastern U.S. member states unparalleled opportunities to forge new ones. 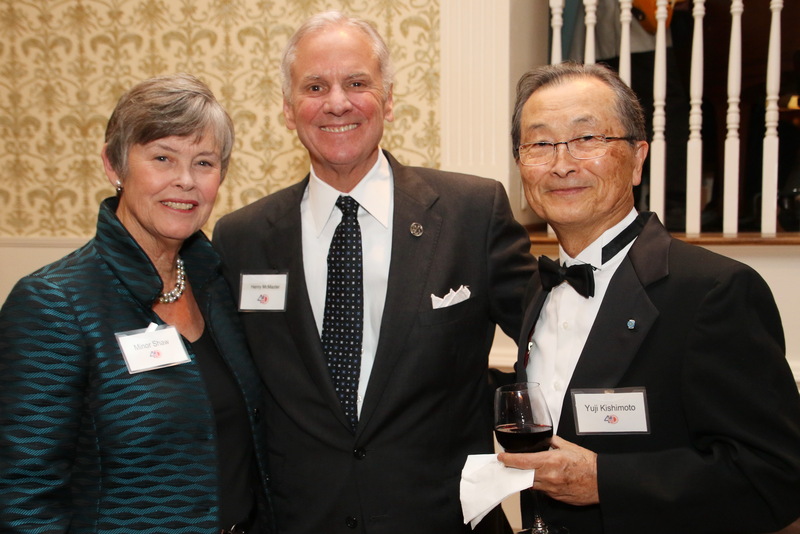 Created in 1976, the Southeast U.S.-Japan Association (SEUS Japan) was established to promote trade, investment, understanding and friendship between Japan and U.S. member states. Today, member states include Alabama, Florida, Georgia, Mississippi, North Carolina, South Carolina and Tennessee. A Japanese counterpart, the Japan-U.S. Southeast Association (JUSSA), has membership comprised of Japan's leading corporations. An Annual Joint Meeting (AJM) between the two associations is held on a rotational basis in Japan and the southeastern U.S., alternating between the locations every other year. Also on a rotational basis, each of the seven states serves as "Host and Co-host State" for a two-year term and assumes leadership of SEUS-Japan during that period. South Carolina last hosted the meeting in Charleston in 2002. The annual conference attracts governors, corporate presidents and CEOs and top economic development and business leaders from the seven southeastern states. Some 350-400 individuals participate in this annual event. 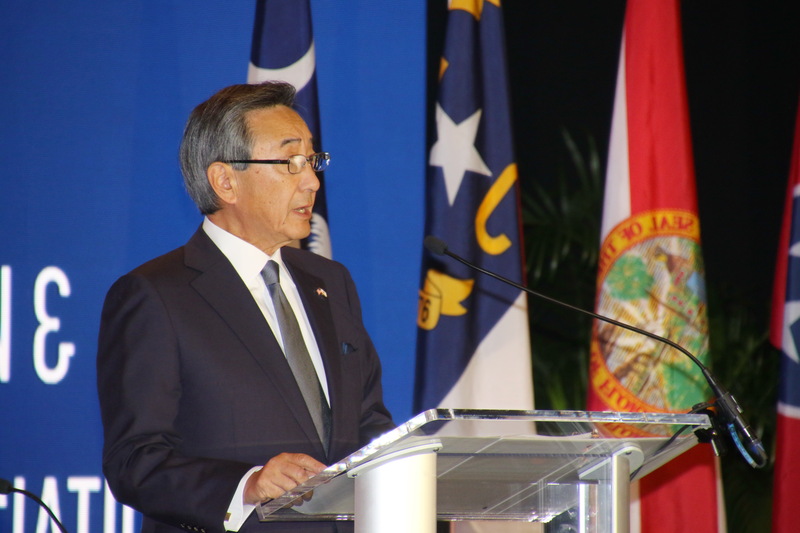 Meetings include top business and political leadership, including Ambassadors and Consul Generals, all representing the most significant aspects of the strong economic relationship between Japan and the Southeast. The 2017 conference features an outstanding lineup of speakers and an exciting series of special activities. This year’s conference theme “Success through Tradition, Innovation & Partnerships” will be reflected in conference sessions on timely and valuable topics such as labor force trends and challenges and where will the U.S.-Japan relationship be in the next few years especially as it relates to trade and investment. 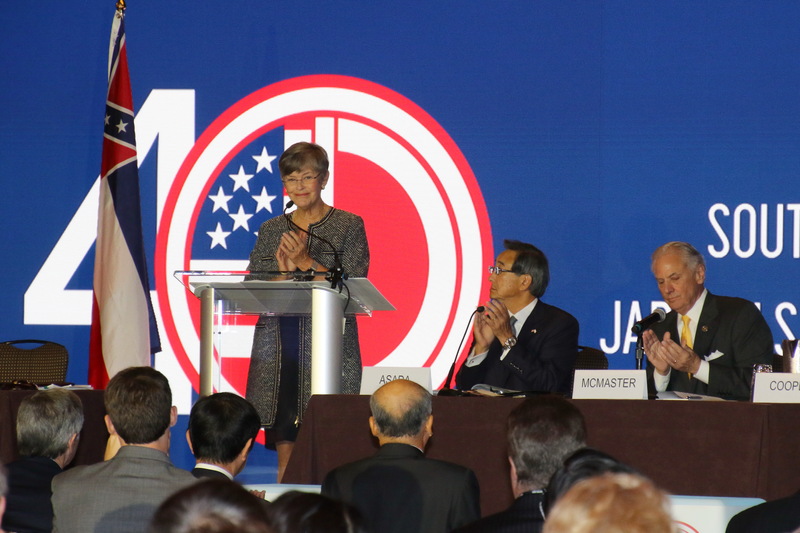 In this, the 40th Annual Joint Meeting perfectly reflects the tradition and the partnerships that have been created between Japan and the Southeast U.S. through the relationship of these two associations. Click here to view more photos from the event on our Flickr page! To attend the SEUS Japan Annual Joint Meeting you must be selected as a delegate to the conference by one of the member jurisdictions in either the United States or Japan. Tennessee Tower, 27th Floor 312 Rosa L. Parks Ave.
Delegates may pick up conference registration packets from Saturday, October 21st at 12:00 p.m. through Monday, October 23rd 5:00 p.m. in the Hyatt Regency, Lobby Level. * All participants are required to register. 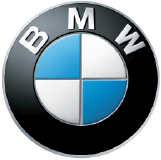 * Contact your coordinator for golf club rental requests. Shoe rental is not available and soft spike shoes are recommended. Enjoy the splendor of South Carolina's natural beauty on a tour of Lake Jocassee, a lake known for its clean water fed from the Appalachian Mountain River. This three‐hour excursion is guided by 'Master Naturalists' who will illuminate the environment of South Carolina and Lake Jocassee. Buses leave for Lake Jocassee at 9:45 am. * Lunch will be provided. This tour includes limited walking but comfortable shoes and clothing are recommended. Tour Clemson University with guidance from Japanese Studies students via the campus’ electric bus system. View the Watt Family Innovation Center, a groundbreaking interdisciplinary research center for students partnered with local businesses and government. Then, tour Death Valley Stadium and the famous Howard’s Rock before venturing to South Carolina’s luxurious Botanical Gardens. Lunch will be provided at Sole on the Green, serving classic American meals with a view of the Clemson Golf Course. Bus leaves Hyatt at 9:30 am; tour begins at 10:30 am. * Lunch will be provided. A significant portion of this tour is outside and provisions will be provided in the event of inclement weather. Comfortable walking shoes are recommended. Experience the booming City of Greenville with a trolley tour. The tour concludes at Flour Field Stadium, home of the Greenville Drive, a minor league team affiliated with the Boston Red Socks. Join Greenville Mayor Knox White for refreshments provided at the stadium’s Champions Club, featuring classic baseball food favorites and beer from the city’s beloved local breweries. Trolley tours begin at 10:30 am. Paint easy, free‐form flowers from your imagination using a reductive scratching technique guided by artist Melinda DeMent. Take home your cheerful 11x14 ready to frame or hang! Following lunch, there will be live artist demonstrations and time for guests to interact with the artist(s). Class will be from 10:00 am – 12 pm in a studio across from the Hyatt, then lunch/artist demos will be from 12 pm– 2:00 pm. With the guidance of local chefs, practice the art of Southern cooking. The class will include chef demonstrations and time for guests to try some of the cooking techniques shared, followed by lunch. This tour will be held at the Corporate Loft at Soby's in downtown Greenville, just a few blocks from the Hyatt. Mr. Rod Schrader, Chairman & CEO, Komatsu America Corp.
Mr. Dave Johnson, Chief Quality Officer, Bridgestone Americas, Inc.
Mr. Masaru Onishi, Director & Chairman, Japan Airlines Co., Ltd.
Mr. Seiichiro Akita, Executive Officer, The Bank of Tokyo-Mitsubishi UFJ, Ltd.
Labor Force Trends and Challenges in Japan & the Southeast U.S. Both Japan and the United States are facing a demographic shift in their work force as the “Baby Boomer” generation in the United States retires and Japan’s population decrease continues to cause labor shortages. How are these issues being addressed in each country? Additionally, how is each country ensuring that each respective labor force is better trained to face the newer, more innovative and technical jobs, especially as they relate to manufacturing? What can government do to help cultivate more entrepreneurs, inventors, technology and innovation start‐ups as another option of employment? U.S.-Japan Bilateral Relations – Where Are We Headed? Where will Japan and the United States’ relationship go in the future, especially as it relates to trade and investment? Free trade agreements are not always exclusive to international trade, but are often used to bolster relationships in other areas such as security and defense. How will those important issues be addressed between the two countries in the short term, within the context of a dynamic Asia‐Pacific region? Premium and Suite Upgrades may be available for an additional fee, based on availability. Room rates are subject to applicable tax that is currently 10% per room, per night and is subject to change without notice. Hotel check-in begins at 3 p.m.
For questions regarding hotel reservations and information, please contact Westin Poinsett, Greenville. If you make your hotel reservation by phone, please mention the “SEUS-Japan Conference” to receive the special conference room rate. For questions regarding hotel reservations and information, please contact Hyatt Regency Greenville. The Hyatt Regency Greenville does offer valet parking ($20 per night) and overnight self-parking ($7.50 per night). Rates are subject to change. Find your sophisticated home in the heart of the downtown area at the Westin Poinsett Greenville - one of the only AAA four-diamond hotels in Greenville, SC. Hyatt Regency Greenville offers guests the perfect balance of Southern hospitality and modern amenities. Located in the trendy downtown area of Greenville, the Hyatt Regency is near the area’s best dining, shopping and entertainment. 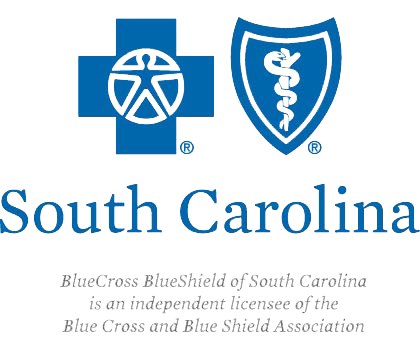 Whether you are visiting for business or leisure, there is a welcoming room waiting for you in South Carolina. With a 2,100-seat concert hall, a 400-seat theatre, an amphitheater, a sophisticated patrons’ lounge and a variety of indoor and outdoor meeting, rehearsal and event spaces, the Peace Center has become the hub of cultural life in Upstate South Carolina. Built on a six-acre campus, with an energetic mix of leading-edge architecture and historic preservation, the campus is at the hub of Greenville’s nationally recognized downtown. Of course, what makes the Peace Center special are the performance venues. Each space is architecturally and acoustically remarkable—as you would expect, considering the quality and variety of performances presented here. Classical, dance, jazz, country, bluegrass, folk, pop and comedy performers, as well as a full calendar of top Broadway shows are equally spectacular on the Peace Center’s stages. Several of Greenville’s excellent performing arts organizations are resident companies. These include Carolina Ballet Theatre, Greenville Chorale, Greenville County Youth Orchestras, Greenville Symphony Orchestra, International Ballet and South Carolina Children’s Theater. In every case, the Peace Center – both the people and the place – provides the right setting for an exceptional experience. Welcome to a place where opportunity isn’t just about an industry or even a category, it’s about an attitude and a way of life. We have created an environment that’s just right. 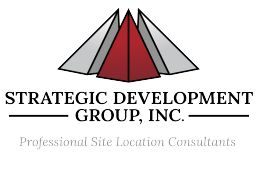 Where people can build a good life while building products and services, and businesses great and small can prosper.